Book Entertainment Or Commercial Personal Ads in Indian Newspapers Instantly Online! In which language do you want to advertise in newspaper? It is the most cost effective forms of advertising in any Newspaper. The Ads appear in the classified section in the standard running text format. Rate is charged per Line/Word/Character basis. Enhancements like tick mark, color, bold font, border lead to extra charges. It is more visually appealing than classified text ads.Here one can add customized font, color, logo or image to make the ad visually more effective for the target readers. These ads are charged on the basis of per sq. 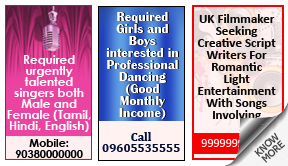 Why Book Entertainment Or Commercial Personal Ad in Newspapers? Property adverts in the classified section is one of the most sought after sections due to the growing and rapidly developing sector of Real Estate. Classified Display ads or column ads have the potential to be fairly attention grabbing as well as generate a good number of reader responses if designed properly. 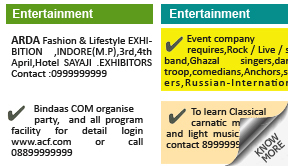 How to Book Entertainment Or Commercial Personal Advertisement In Newspapers? At first, simply select the ad type which is Classified Text in this case which directs you to the page where you can choose your category as Property and also select the newspaper of your choice. You also have the option of different combo packages to choose from in order to avail discounts. In the next step, you are taken to the ‘Compose Ad’ page where you can create, compose and design your advertisement. Though text ads are simple and consist only of words, they can be enhanced and made more prominent with the help of ad enhancers available on our websites. These enhancers include background colours, ticks, screen borders, language translations and more. The use of such enhancements makes the advert more prominent and easily catches the attention of the readers. After you are done with the ad composition, you can view how your ad will appear in the newspaper chosen by you with our exclusive Live Ad Preview Feature. Last but not the least; you can proceed towards making the payment for the advertisement to confirm the timely release of the same. You can make your payment via our online [Debit/Credit Cards, Net Banking (All Indian Banks)] or offline [Demand Drafts, Cheques, NEFT (Online Cash Transfer) and Cash collection from your doorstep] mediums as per your convenience. The first step comprises of choosing the ad type as Classified Display which in turn takes you to the page where you can select the category as Property as well as the newspaper in which you want your advertisement to appear. You can also choose from a range of discount packages available for multiple edition or newspaper ad releases. On the second step, you can select the basic design template from a range of pre designed formats, which are available both in colour and black and white. This pre designed template can be designed according to your own preferences with the help of colour change options, text formatting, image and logo uploading etc. On the ‘Compose Ad’ page you can also upload your own designed advert and specify the length and width of the same. ReleaseMyAd provides you with an exclusive option to have a glance at your advertisement before it is published in the newspaper with the Live Ad Preview Feature. In the last stage you can simply make your payment with the help of our online or offline payment modes. The online payment options include payments via Credit/Debit Cards, Net banking while the offline mediums vary from Demand Drafts, Cheque Deposits, Cash Collection from your office or home and NEFT (Online Wire Transfer). Q. Hi, I am Sakshi Ranjan, a student of CMRIT Bangalore. I wanted to write a small article about the importance of a "Media club cell" in college life in order to spread awareness about it. I would like to write a small column about it and would also like to know the rates. Please suggest a newspaper and rates. Q. We are Pinnacle Film Studio, hunting talented fresh artists male/female from all age groups from Mumbai. We want to know the tariff. Kindly revert back.